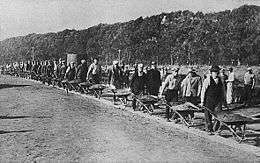 The Civil Works Administration (CWA) was a short-lived U.S. job creation program established by the New Deal during the Great Depression to rapidly create manual labor jobs for millions of unemployed workers. The jobs were merely temporary, for the duration of the hard winter of 1933–34. President Franklin D. Roosevelt unveiled the CWA on November 8, 1933, and put Harry L. Hopkins in charge of the short-term agency. The CWA was a project created under the Federal Emergency Relief Administration (FERA). 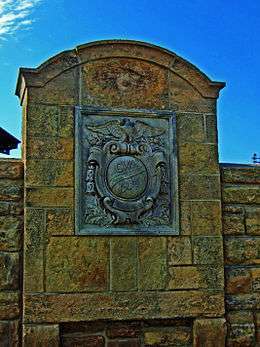 The CWA created construction jobs, mainly improving or constructing buildings and bridges. It ended on March 31, 1934, after spending $200 million a month and giving jobs to four million people. The CWA's workers laid 12 million feet of sewer pipe and built or improved 255,000 miles of roads, 40,000 schools, 3,700 playgrounds, and nearly 1,000 airports (not to mention building 250,000 outhouses still badly needed in rural America). The program was praised by Alf Landon, who later ran against Roosevelt in the 1936 election. Representative of the work are one county's accomplishments in less than five months, from November 1933 to March 1934. Grand Forks County, North Dakota put 2,392 unemployed workers on its payroll at a cost of about $250,000. 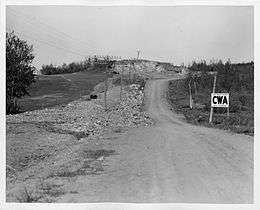 When the CWA began in eastern Connecticut, it could hire only 480 workers out of 1,500 who registered for jobs. Projects undertaken included work on city utility systems, public buildings, parks, and roads. Rural areas profited, with most labor being directed to roads and community schools. CWA officials gave preference to veterans with dependents, but considerable political favoritism determined which North Dakotans got jobs. Although the CWA provided much employment, there were many taxpayers who saw leaves being raked but nothing of permanent value. Roosevelt told his cabinet that this criticism moved him to end the program and replace it with the WPA which would have long-term value for the society, in addition to short-term benefits for the unemployed. Four million jobs in two years? FDR did it in two months. University of Washington Libraries Digital Collections – Civil Works Administration Photographs 119 images showing work projects in King County, Washington established under the auspices of the Civil Works Administration in 1933-34.